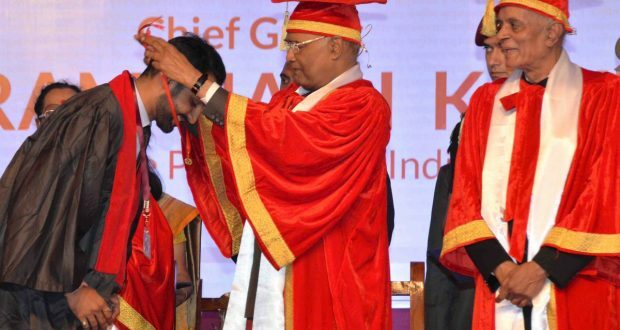 Pune:23/10/18:The President of India, Shri Ram Nath Kovind, graced and addressed the 15th convocation of the Symbiosis International University in Pune today (October 23, 2018). Speaking on the occasion, the President said it is a matter of pride for us that India has been a centre of learning for centuries. From Taxila to Nalanda, the subcontinent’s age-old universities attracted students from different parts of Asia and beyond. In modern times as well our campuses have been open to and welcoming of talented young people from many countries, especially those in our neighbourhood and in Africa – a continent with which we have a special relationship, shaped in classrooms. The President said that it is worth noting that 46,144 international students from 166 countries study in various colleges, universities and institutions of higher learning in India. Symbiosis plays a significant role in this process. He was happy to note that over 1,000 international students study in Symbiosis. Of those who graduating today, 329 students are from 33 countries other than India. He said that this adds to the multicultural and cosmopolitan atmosphere of Symbiosis’s campus, and promotes goodwill among nations. The President said that India has a massive network of 903 universities and 39,050 colleges. But the fact is there are still gaps in quality and in attaining world-class excellence across the spectrum. In this context, the government has taken a decision to promote and support 20 institutions of higher education as “institutes of eminence” – to grant them recruitment and curricula flexibility in order to reach best-in-class global standards. He urged administrators, professors and students and alumni of Symbiosis to aim to build and locate at least one such “institute of eminence” at their University.